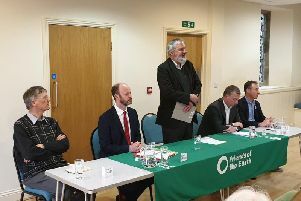 The Green Party has selected its candidate for the Tynemouth Constituency in the forthcoming General Election. Julia Erskine will be the candidate for the election on June 8. Born in Wallsend, Julia has been a resident of North Tyneside most of her life, spending the last 13 years in Whitley Bay, where she is self-employed. She runs the twice-monthly Whitley Bay Craft & Car Boot Fair while is also a trustee of Mityana Community Foundation, a charity which originated in Whitley Bay and works with the Mityana community in Uganda, in scouting and teaching. As a Green Party MP, Julia promises to work with the local and national Green Party to bring policies into the Tynemouth constituency. She said: “We have so much of value in Tynemouth Constituency, but there is also much as risk. “Our green spaces are at risk of being swallowed up by development; our businesses are struggling; our residents are being priced out of the local housing market; we have a chronic shortage of social housing; and air pollution and traffic congestion are serious and growing problems. Green policies are about sustainability, fairness and our relationship with our environment.